I originally posted this to Facebook, but copied it here for easier sharing. Be warned, this is a long post. If you wish to comment, please do so only after reading the full content of what I’m sharing here, including the linked articles. Most of what I’ll be sharing was written by others. * But first, allow me to briefly share a personal story. I grew up in the church. I was always taught that abortion was wrong. Period. No shades of gray. So it’s no surprise that I understood myself to be a pro-life Christian (and still do today, albeit from a much more nuanced position than before). And I carried these perspectives into ministry. It’s not something I ever thought much about. It all seemed pretty simple — until it didn’t. (Life has a way of challenging us.) Many years ago, as a very young pastor, a newly married couple asked if they could privately meet with me. They were expecting their first child, and had been so full of joy. That’s why I was so surprised when they showed up at my office full of sadness and disappointment. The joy was gone. They had just learned that their baby wasn’t developing properly. I don’t remember all of the medical terminology, but the baby was developing in a way that not only threatened the life of the mother, but would’ve brought excruciating, excruciating pain to the baby when born. This family met with me in heartbreak and tears. The last thing they wanted was to lose their precious child; at the same time they had immeasurable compassion and love for their child. As I continued in ministry, I encountered more stories like this. I share this story because it’s cruel and insulting to think that mothers and families are cold hearted when making the most excruciating, broken-hearted decisions of their lives. They’re not being casual, callous, thoughtless, or cruel. They are trying their best to do what they think is the most loving and compassionate thing to do, given the heartbreaking moment in which all their deepest hopes feel lost. I know some pastors who say that God can do miracles, and I’m aware that amazing things can happen beyond anything we can expect. But that is also the exception to the rule. I think it’s only fair, at the very least, to have understanding and compassion for mothers and families in these moments. Not to do so says far more about you than them. And the last thing anyone should do to a grieving family who has lost everything they dreamed of is to gloat that God did for you what God didn’t do for them. I was 17 weeks pregnant when I found out that [my son] had a condition that would make him incompatible with life. It broke me in ways you will never understand until you experience it yourself. I hope you never do. I wasn’t 24 weeks yet, but I already loved this baby. I named him. I had dreams of holding him, of kissing his little fingers and toes. Dreams of what his giggles would sound like. I wanted him, so very badly. How much worse must it be for women who have made it to 24 weeks or more? I had to make a choice. As you can see [note from Phil: this FB post contained the last picture taken of Lindsey’s son], he was badly swollen. What you can’t see is that his organs were surrounded by fluid. He was going to drown in the substance that was supposed to keep him safe. I wanted to try to carry to full term so that I could donate his organs to a baby that had a chance. Unfortunately, doing so would have nearly guaranteed that I would have developed eclampsia, had fatal seizures and left my other beautiful sons without a mother. There was only a 20% chance that I would even have made it to full term, because of the severity, and if he had passed before that, his organs would not have been eligible for donation. I made the heartbreaking choice to terminate via induction of labor. My doctors moved quickly, but showed more compassion towards me and my son than many of the people who claim to be pro-life. I was given a chance to hold him and say good-bye. My story is not uncommon. The stories of the women put in this position through no fault of their own are heart-wrenching. The new law does not allow for healthy full term babies to be aborted. It does not allow for murder, yes a life is ended but it is an act of mercy. The law protects the women who are forced to make the hardest decision of their lives and the doctors who care for them. “If you know anyone who is clutching their ideological pearls over various abortion laws being implemented or under consideration around the US, please send them this article [linked below] and invite them to think with compassion and within the bounds of reality, rather than going along with the hatred of women so many anti-abortion arguments are crafted around. What these laws do is place the authority for a medical decision in the hands of a patient and their doctor, not a governing body that is ignoring science in order to advance a religious agenda. Late-term abortions involve the loss of a wanted and expected child, whose survival is either not possible or whose birth threatens the mother’s life, or both. Anyone who pictures women gleefully lining up to kill a child that’s two minutes from being born are participating in a cruel and heartless politics that fundamentally hates women and disdains mercy and care for those in tragic circumstances. They are also willfully ignoring the fact that making abortions more difficult to get means depriving families of medical care and causing more trauma and suffering. I did my chaplaincy training on the high-risk pregnancy floor at a hospital. I sat with families and helped them make decisions and funeral arrangements in the midst of a loss of their hopes and dreams for a life that couldn’t be saved. To deny these families and individuals the ability to make a hard decision with the help of a doctor’s advice compounds their grief. These laws lets doctors and patients take back their ability to make the decisions that are right for them in this difficult time, and stops religious fundamentalists from spreading their misery through the law. We must call out the liars who seek to cause suffering just to satisfy their own sense of twisted self-righteousness. And also demand that people approach issues like this with compassion and education, and not with knee-jerk reactions to sensationalist propaganda. * Please note that each of these reflections were set to public on FB, or shared with the permission of the authors. Here in the Bible Belt, it’s not uncommon for people to think that saying “Merry Christmas” — as opposed to “Happy Holidays” — somehow recovers the true meaning of the season. But this is hardly the case. I don’t say this as a nihilistic cultured despiser of religion. I say it as a Christian pastor who very much loves the Christmas season and wants to recover all that it means. The phrase “Merry Christmas,” on its own, expresses a beautiful sentiment of well wishes for others. It can be understood as a shorthand way of saying, “I hope the birth of Christ brings you hope, peace, joy, and love,” which are the Advent promises. But here’s the thing. Nowadays, the phrase “Merry Christmas” gets used in very different ways, with very different connotations. Instead of saying that one hopes the birth of Christ brings hope, peace, joy and love to others (including those outside the Christian faith), it’s frequently weaponized. It’s fallen victim to the incessant culture wars that mark the increasingly surreal landscape of existence in modern day America. “Merry Christmas” has morphed into a positioning statement that has more to do with establishing one’s identity in the culture (usually as a conservative Christian) than in expressing what one hopes for others living in the culture (whether they identify as conservative Christians or not). What’s more, “Merry Christmas” is often delivered as an opening salvo to anyone who dares challenge the power and dominance of the Religious Right in the history and culture of the United States. Instead of being connected to what the biblical stories about the birth of Christ actually say, this phrase is unplugged from the biblical tradition; it’s become a shorthand way of thumbing one’s nose at those who don’t celebrate Christmas (even though most non-Christians in the U.S., who comprise less than thirty percent of the population, are not in the least bit offended by those who do celebrate Christmas). It’s cheap rhetoric. After all, it’s much easier to say “Merry Christmas” than to actually care about what the birth stories teach. It’s much easier to wage culture wars in the name of religion than to actually live by the principles at the heart of the Christmas narratives. It’s much easier to put up nativity scenes, even with big letters that spell “Jesus,” than to follow the way of Christ. Much of the rhetoric surrounding “Merry Christmas” serves as a mask for avoiding the deeper implications of Jesus’ birth and what it means for us today. Let’s not forget that Jesus and his family were refugees fleeing violence (recall Herod’s massacre of the infants and the Holy Family’s flight to Egypt, as recorded in the gospel of Matthew). Yet in our culture today — in a cruel stroke of irony — it’s the Religious Right that is most hostile to refugees fleeing violence. In fact, conservative Christians in the U.S. represent the largest demographic that supports policies that tear gas refugees and place them in cages. Until we repent from sanctioning such inhumane policies, we can’t begin to say that we take the Christmas stories seriously. You can choose to support such inhumane policies all you want — that offense is on you — but you can’t claim to honor the meaning of Christmas when doing so. If we wish to conserve the true meaning of Christmas — if we wish to be conservative in our reading of the biblical stories — we must remember that the birth of Christ was never about dominant groups using their religion to discriminate against others. Quite the opposite. Jesus and the Holy Family were marginalized from the beginning by the most dominant groups in society. Contrary to what Stephen Miller and the Trump administration may think, Jesus didn’t do the oppressing. It was the other way around. As O Holy Night recalls, in Christ’s name “all oppression shall cease” — not be amplified. If we wish to offer a Merry Christmas to others, then we at least need to have the courage to honor what the stories actually say. Otherwise it is we, the Christians, who are the true cultured despisers of religion – because we know what the stories say but we refuse to acknowledge them in order to serve our own self-interested goals. Which is the ultimate form of nihilism. (1) It’s not illegal to seek asylum in the U.S. It’s perfectly lawful. The migrants are not breaking the law in their attempts to do so. (2) Tear gassing children is inhumane, unconscionable and cruel, full stop. This represents a total failure of leadership on multiple levels. If you wish to defend this practice by appealing to whataboutism, then you haven’t provided an ethical justification for it; you’ve simply heightened the ubiquity of the practice and the urgency of meaningfully responding to it. (3) Anyone who wishes to say “we are a nation of laws” must first ask why our own leaders are violating our very own laws set in place for asylum seekers. The border was closed preemptively in order to keep the migrants from applying for asylum. You can call this shifting the goalposts or violating the laws of the land; both are unlawful. (4) Those who say progressives are arguing for open borders fail to listen to what we’ve been saying all along (perhaps to a fault): all we want is for our leaders to follow the laws currently in place for migrants seeking asylum, and to provide proper resourcing to carry out these laws. We are asking for law and order. Protecting the border begins by protecting the laws at the border and making sure our country has the resources necessary to implement the laws in place. When we have to resort to other measures, we have failed. We are a nation of laws. When these laws aren’t fair, when these laws fall short of the call for justice, then we need to follow proper protocol in order for such laws to reform and reconfigure so they better align with justice, fairness, and dignity. (5) The horrific systemic violence these migrants are fleeing is worse than what Saddam Hussein did to his people (just read the Amnesty International reports). Which makes me wonder: Why did so many Americans back then think it was noble and courageous for us to spend billions (trillions?) on a war to “liberate” the Iraqi people from the evils of Hussein’s regime (you’ll recall this was one of the most popular justifications made by those championing the war effort), but now, when it comes to tangibly helping people at our border who are fleeing traumatic violence that is far more severe, we are now hostile to the idea of investing paltry sums of money and resources (by comparison to the war effort) to help those who are most desperate right now? While this may sound like the height of hypocrisy, it’s perfectly consistent with a narrative of American aggression against people of color. This is a very ugly truth that is in the DNA of our country. Dominant power structures in the U.S. idolize violent aggression, especially against people of color. Note that this also answers the question of why those most hostile to immigrants are usually and ironically the descendants of European immigrants who “founded” this country by (a) stealing land from indigenous peoples, (b) committing genocide against indigenous peoples, and (c) enslaving Africans: Again, the common denominator is aggression against people of color. The same is true today. (6) Relatedly, I’m disturbed by the fact that no small number of people get a perverse pleasure in watching the suffering of others. (7) Using pejorative language like “illegals” (or “illegal aliens”) is intentionally designed to dehumanize those seeking asylum in order to make the inhumane treatment of other human beings more palatable. It’s a classic form of “othering” that is historically connected to racism, discrimination, and genocide. (8) As I think about the exchange between Alexandria Ocasio-Cortez, Lindsey Graham, and the Auschwitz Memorial (which quickly shut down Graham’s mansplaining on Twitter), I keep wondering where we are in this narrative. Are we more like 1930s Germany, when Jews were being dehumanized and “othered”? Or are we more like those countries who refused to grant asylum to Jewish migrants fleeing certain death? (9) Even though Facebook will be Facebook, I’m still taken aback at just how cold-hearted and calloused some people are. I understand if to a certain extent we disagree on best policies, but how can a person not have any sympathy for those desperate to survive? How does one take this so lightly, replete with lots of haha emojis that make fun of the suffering and sadness of real human beings??? This is truly awful. I suppose this is related to item 6 above. (10) We can’t forget that our foreign policy (including the sale of arms) has contributed to massive amounts of suffering in Central and South America. We’ve supported numerous despotic regimes and propped up oppressive power structures for decades. Complaining that people are fleeing violence that we have no small hand in creating is akin to setting a family’s house on fire and locking the doors and blaming them for trying desperately to escape. Or tear gassing their house and when they try to find refuge in our house we tear gas them again to keep them out. (11) I don’t know what your views are. You may or may not be in favor of helping desperate people flee from violence and find safety. Whatever. Just don’t use Christianity to justify your views. Especially at Christmas. Recall Herod’s massacre of the infants. Recall the Holy Family (Mary, Joseph, and Jesus) fleeing to Egypt to escape violence. If Egypt had the same policies currently in place at our southern border, it’s likely that the Holy Family wouldn’t have survived. And recall Jesus’ words to welcome the stranger. Hell, he even has a parable where those who don’t welcome the stranger go to hell. So just stop. Don’t. And if that’s not enough, recall Jesus’ tradition. He was Jewish. And the Torah (what Christians call the Old Testament) repeatedly talks about treating the foreigner and the immigrant as one of you. So please. Enough with the empty appeals to religion. All it does is cloak your discrimination in the name of God, which is a prime example of taking the Lord’s name in vain. Which goes against the 10 Commandments. So stop. If you want to be inhumane, own it your damn self. It’s your prerogative. But don’t go around saying Jesus supports your views when all the evidence shows he doesn’t. 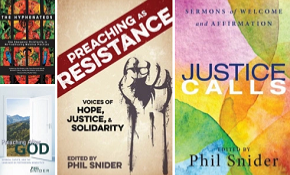 Preaching as Resistance — now available!